I will put things here without hurry. I will never claim any great breadth; at most I hope to offer some corrective to the lists I have found on the web that offer titles without any objective critical assessment. I break the list into first the more 'reference' style works followed by critical works. I will list the latter group alphabetically by author. Pictures unceremonially stolen from Amazon. Though, to note, not everything below is still in print. A First-Draft Version of Finnegans Wake, David Hayman, ed. The Workshop of Daedalus, Robert Scholes; Richard M. Kain, ed. McHugh, Roland. Annotations to Finnegans Wake (1980, 1991, 2005) — Invaluable and pretty much essential work for reading the Wake with any depth. People sometimes think this is a reading guide: it is not. It identifies (not explicates), page by page, historical, fictional, cultural, geographical, etc., references; obscure or unfamiliar vocabulary Joyce may have used; foreign language terms and phrases; and a lot more. However, because I call it "essential" does not mean that you should read the Wake looking up every reference and line in McHugh before hand. Not at all. I recommend looking to McHugh only when in your reading you feel the need, whether it be for in depth analysis of a passage or merely to fully catch a theme what you sense but are missing. This is but a leaping point, though. The Annotations do not give the story of, say, Tristan and Iseult; it just points to it. 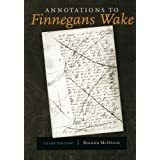 Finnegans Web wiki — Of the same nature as McHugh's Annotations but online as a public wiki is Finnegans Web. There is a great amount of information being piled up on the pages (accessed by clicking on the text). Though, being a wiki, it is open to modification by anyone; as such, while there is good information to be found, there is also a lot of spurious information, and no small amount of demonstration of taking finding 'references' within the Wake to an absurd conclusion. Like McHugh, this is solely a collection of references (probable, possible, and absurd), not meant to be a 'reading guide.' Useful, yes; but, use at your own risk. O Hehir, Brendan, and John Dillon. A Classical Lexicon for Finnegans Wake (1976) — a page by page indentification of references to classical themes, persons, places in the Wake, with some explication on those themes. Very useful work (including extremely useful appendices), and, best of all, available online in a searchable pdf at the Internet Archive (here). Benstock, Bernard. 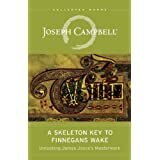 Joyce-Again's Wake: An Analysis of Finnegan's Wake (1965) — Generally considered one of the top tier critical books on the Wake. Covers such topics as the use of religion and politics within the Wake, the comedic and the poetic, and examining the Wake as an 'epic.' As well, it presents a useful outline of the Wake that is still frequently referred to. (I have written it upon the pages of my copies.) May not be accessible to a beginner, but highly recommended. Bishop, John. 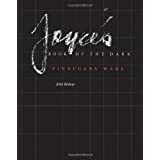 Joyce's Book of the Dark: Finnegans Wake (1993) — If I were to recommend one critical book for a newcomer to the Wake, this is it. (And I have done so.) Rather than being focused on narrative or referential details or themes, it addresses the nature of the Wake as a dream. As such, it is greatly a ground level presentation of what Finnegans Wake is, what Joyce was trying to do, and how to read it successfully. Plus, it is simply a wonderful piece of scholarship. Campbell, Joseph, and Henry Morton Robinson. 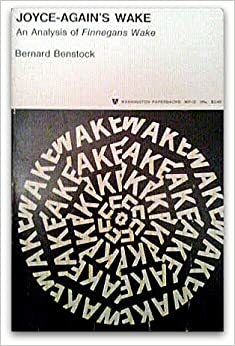 A Skeleton Key to Finnegans Wake (1944, 1961) — Offers a unified reading of the Wake that recognizes the symbolic/mythic nature, the 'dream' structure of the Wake and tries to show the interrelated, overlapping structures of the Wake (that is, it not try to collapse the work into a straight narrative). However, it has to be recognized that this is the first such attempt by any scholar (published a mere fiver years after the Wake was published). As such, there is much in here that has since been either corrected or outright eliminated as mis-readings. However, and recognizing its limitations, I found reading the Skeleton Key very useful in my first entrance into the Wake because, like Bishop's Boook of the Dark (above), it speaks to the nature of the Wake: it teaches how to read the Wake. If you read it, however, keep in mind that it was the very first go at a unified reading, and has all the expected errors that that would bring with it.